Psychological safety is the belief that one will not be punished or humiliated for speaking up with ideas, questions, concerns, or mistakes. It is a dynamic, emergent property of interaction and can be destroyed in an instant with an ill-timed sigh. Without behaviors that create and maintain a level of psychological safety in a group, people do not fully contribute — and when they don’t, the power of cognitive diversity is left unrealized. Furthermore, anxiety rises and defensive behavior prevails. 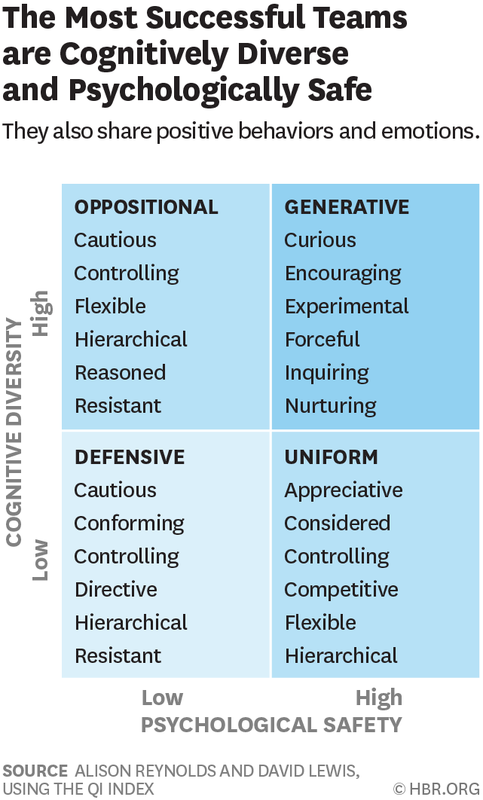 If you look at the various quadrants in the header image, taken from the HBR article, then it’s clear that we should be aiming for less hierarchy and more diversity. We choose our behavior. We need to be more curious, inquiring, experimental and nurturing. We need to stop being hierarchical, directive, controlling, and conforming. It is not just the presence of the positive behaviors in the Generative quadrant that count, it is the corresponding absence of the negative behaviors. When you’re in a leadership position, you have a massive impact on the cognitive diversity of your team (through hiring decisions) and its psychological safety (by the way you model behaviours). How people choose to behave determines the quality of interaction and the emergent culture. Leaders need to consider not only how they will act, but as importantly, how they will not act. They need to disturb and disrupt unhelpful patterns of behavior and commit to establishing new routines. To lay the ground for successful execution everyone needs to strengthen and sustain psychological safety through continuous gestures and responses. People cannot express their cognitive difference if it is unsafe to do so. If leaders focus on enhancing the quality of interaction in their teams, business performance and wellbeing will follow. Everyone, of course, will see themselves as being in the ‘Generative’ quadrant but perhaps the trick is to get feedback (perhaps anonymous) as to whether that’s how other people see you.